"I want manipulate the crystal. I want to control the light. When the light dies, the crystal dies." If you go through the innumerable bowls, vases, candlesticks and other things that Jan has created, you can see the play of light in the minimalist shapes. Nothing unnecessary is included. 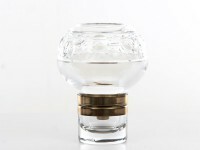 The light, which is often refracted by cutting the crystal, provides the character and personality that each object has. The pure shapes have brought the traditional cut crystal into the contemporary artistic expression. Even though the style may be modern, a noticeable respect for tradition and history is present. To do the traditional techniques justice he created a range of vases in Ariel technique. In the Ariel technique air bubbles are intentionally captured between layers of coloured glass. Another example of the fusion between history and contemporary aesthetics is the bottle for Renat Brännvin (a Swedish brand of vodka). He was commissioned to design the new bottle in 2002. His own comment about the design was that he wanted to create a "beautiful and pure bottle with masculine features". The grooves on the bottle are said to be inspired by the sand on the bottom of the lake Vättern in Sweden. Even more people were given the opportunity to see Jan's work when he was commissioned to design the Eurovision Song Contest award in 2005. Orrefors produced the award sculpture for the two following years as well. Jan who came to Orrefors in 1969 is originally trained as a silversmith at the College of Arts Crafts and Design in Stockholm. He often combines the crystal with stone in his sculptures to create a contrast between clear crystal and solid stone. A long and stable career has yielded a great number of exhibitions and also representation at some well reputed museums. Those who want to enjoy superb Swedish design can visit The Corning Museum of Glass in Corning, New York or the National Gallery of Victoria in Melbourne. In Sweden his works can be seen at Nationalmuseum in Stockholm and the Museum of Glass in Växjö.